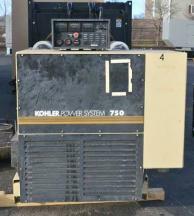 700 KW Kohler Model 750R0ZD4, Diesel Generator set, open skid, 2000 Year Model, 277/480 Volts, 3 phase, 60 Hz, No Fuel Tank, Powered by a Detroit Diesel MTU 12V2000, 513 Total hours. Unit has been serviced, load tested. 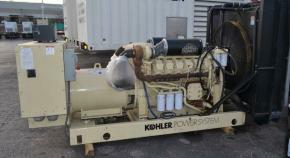 Very nice Open Power Unit. DEC 3+ Controller, 1200 Amp Main Breaker, Dual Silencers, are loose for mounting.